Back in June, I wrote about how I felt like we were being extorted by Dish Network satellite service in regards to HD service. How they basically told us that we could just take it, or go away. We decided to go away. Initially we toyed with the idea of switching back to Direct TV or even to cable, but what we found was that all of them play serious games with their pricing structure. They all talk up their low, low pricing specials, but those only last for the first year … of a two year contract! For that second year, we’d be paying what amounted to the same high fees we’d been paying to Dish. I also found that during our discussions with each outfit, they projected every confidence that we’d eventually cave in and sign up, that there really wasn’t any choice. They were wrong. We canceled our satellite service and I hooked up the aerial antenna again. For the first couple of days, it felt like they might have been right. We live in Phoenix, and although there are several tens of DTV stations available, we are apparently in the broadcast shadow of a nearby mountain. So we only have 7 channels to choose from, half of which are PBS — although I have to admit that with DTV, they do come in crystal clear. Fortunately, there are other alternatives for watching our favorite shows. Most everything we want to watch is available on Hulu.com, so we can watch them from our computers. New shows aren’t always immediately available when they broadcast, but it’s usually only a matter of a few hours, or at worst, the next day before the latest episode is available. For the TV in the family room I dusted off an old PC I had laying around that just happened to have an S-Video port. I installed Ubuntu and Boxee on it, connected it to the TV, and picked up an inexpensive pc-remote control from Amazon. Boxee is an application — available for Windows, Mac, and Linux — that allows you to select and watch TV shows and clips that are freely available across the web. 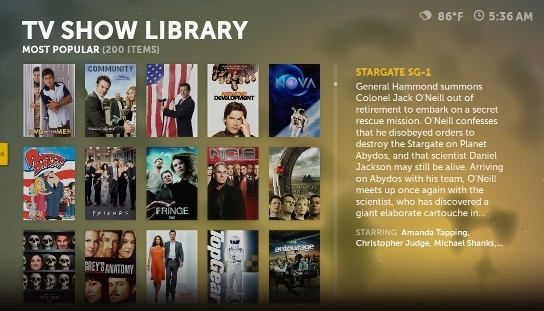 The servers at boxee.tv continuously check the broadcast network websites, such as CBS and Syfy Network, as well as other websites, like Hulu, to compile an organzied list of television shows, movies, and clips into the Boxee application that can be easily navigated with a remote control. All for free. The hard part is connecting up a computer to the TV so these programs can be watched there, instead of from your PC or laptop screen. Fortunately, D-Link has been working with Boxee to create Boxee Box, a TV appliance that runs Boxee. The Boxee Box has all the normal TV hook ups built in so it will be as easy to connect to the TV as a DVD or Blu-ray player is. The Boxee Box is not quite available yet — D-Link is expecting to release it in November, just in time for the Christmas season — but it can pre-ordered from Amazon for about $200. So we’ve been living this way for several weeks. We still watch all the shows we’ve become addicted to. The only thing we do miss is being able to sit in front of the TV and just flip through channels. On the plus side, we now tend to watch TV with a purpose, and when the show is over, it gets turned off. I haven’t missed the Satellite service at all.